I recently published a post on the merits of improving my handwriting or “penmanship”. This had the flow on effect of triggering some consideration about my note-taking in general, which commonly occurs in both digital and analogue (hand-written) forms. Digital or Analogue – Why not just choose one? Why not simply go all in with handwritten notebooks, a manual calendar or perhaps a Bullet Journal type system? I don’t believe this to be possible in the way I like to interact with my work, hobbies, thoughts, and just about everything I either enjoy, or am required to accomplish on a day-to-day basis. In reading that sentence over, more accurately, I choose not to work this way. I’m sure if I wanted to, I could “go off the grid”, however I enjoy using my digital tools as much as I do my analogue ones, having put a good deal of effort into setting things up so they work well together, as I have seeking out great pens and notebooks. I believe the two can co-exist happily, complementing each other, rather than requiring isolation or resulting in duplication. Just the other day for example, working through a tutorial on the longer form writing Mac application Scrivener, it seemed appropriate to jot down the key points in my Field Notes Arts Edition. If I am entirely honest, with so much more to learn, I would be pretty disappointed not to pursue greater integration and understanding of my technology, or ongoing expansion and evolution of my pen and paper collection. First and foremost, the essence of any tool is that it does what you require of it. For note-taking, whether a list, outline, mindmap or draft blog post – it gets the job done with a minimum of friction. True, certain situations dictate only certain tools can be used. For example I cannot check the weather forecast or send a text message with pen and paper (or perhaps I can). …as I sit here in the pre-dawn lamp glow drafting this post in longhand, I cannot think of a more pleasant sound than the Pelikan nib gliding across this Rhodia paper. Agreed. Probably a little more than simply getting the job done. Hardware design of both mobile devices and Macs is certainly important, however for most of us remains fairly stable over extended periods of time, and is something I probably take for granted. Thinking about why I enjoy my digital tools, it is generally in terms of the user interface and software features. 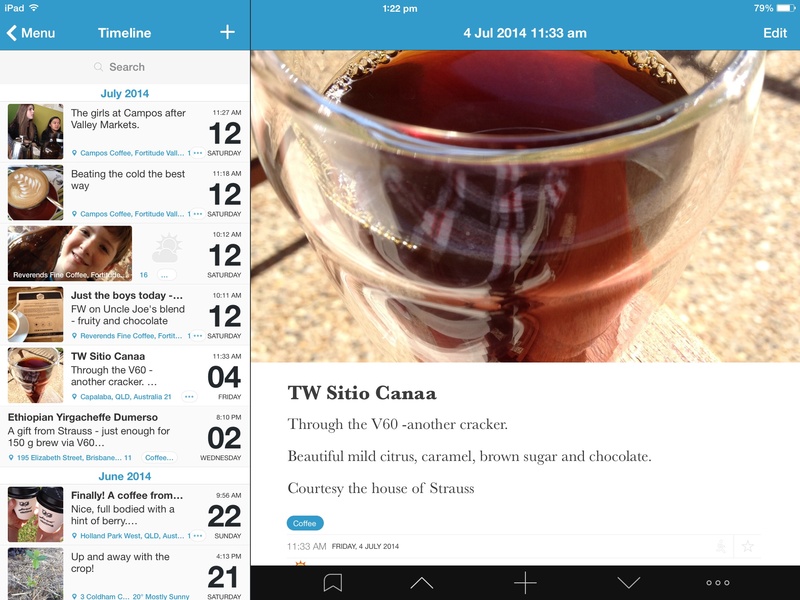 The beautiful way Day One captures and presents moments in my life; the power of Drafts or nvALT in capturing and processing notes; the automation of Editorial; or elegant simplicity of Vesper. My analogue tools? More deeply engrained in the senses. Sounds, textures, colours. The feel of blank paper and how this changes when full of words. 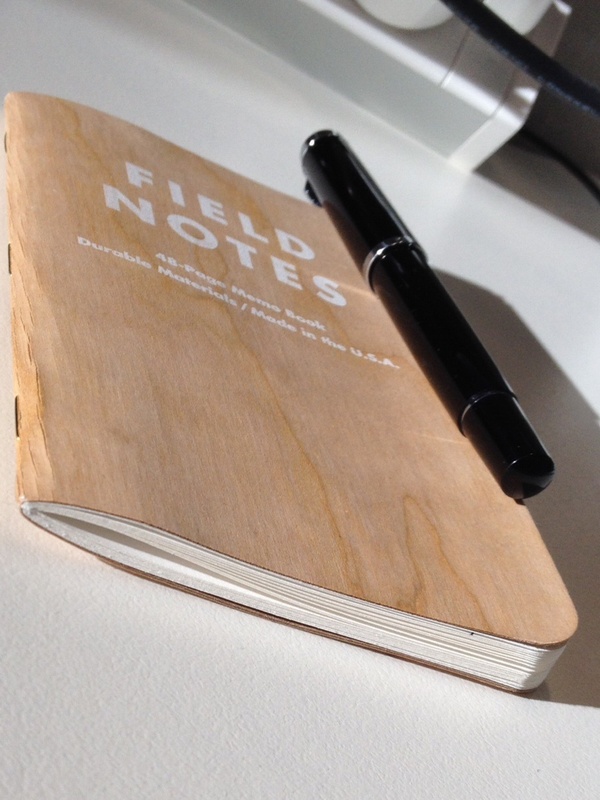 The wear patterns of a Field Notes notebook by the time the last page rolls around. Once archived, the joy of page one in the next. The different weight and balance, finish or colour of a new pen. The sound of a pen across a page as it crafts a line with the purest ink. The fundamental question for me, is whether or not there is joy, delight or inherent satisfaction in the way I interact with my surroundings or tools, be they analogue or digital. 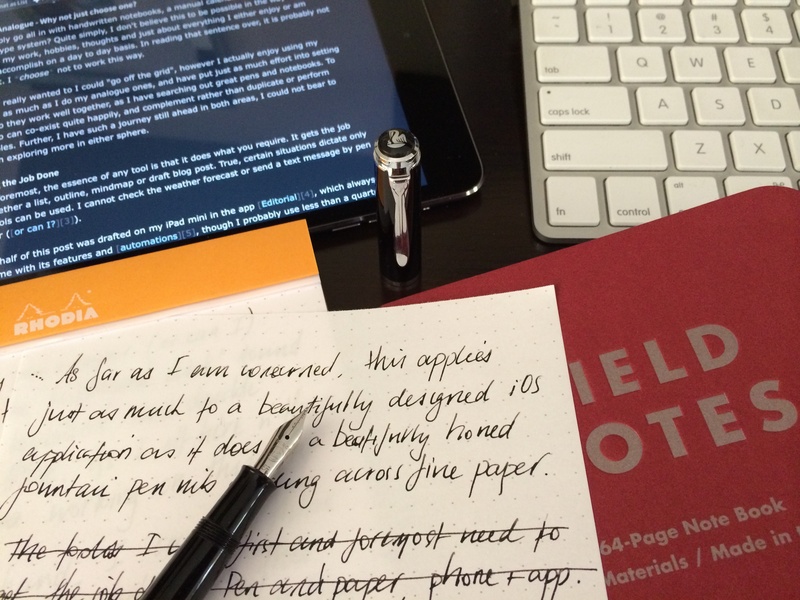 In the tools I choose to use, the answer is yes, and applies equally to a powerful but beautifully designed iOS or Mac application, as it does an exquisitely honed fountain pen nib gliding across the finest paper. Some have suggested with technology marching on (which I readily embrace), the death of the pen is nigh. To those who know the truth? We just post the cap and write on. Smiling.